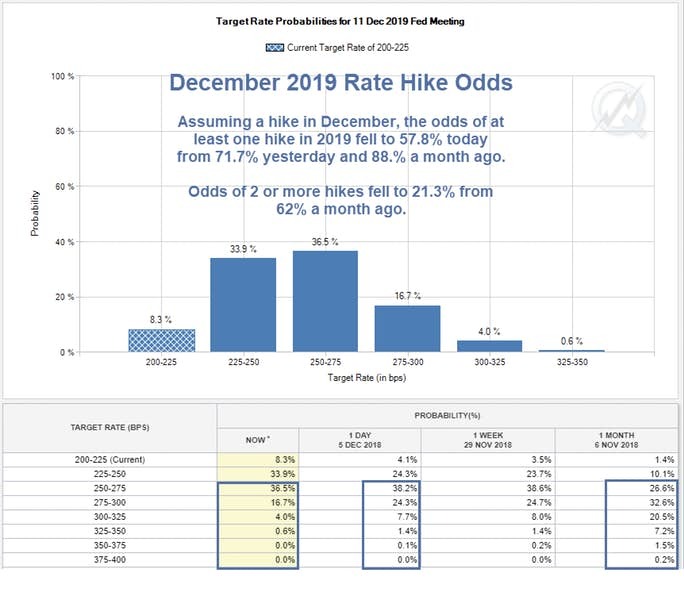 Rate Hike Odds Dive: Any Rate Hikes in 2019? Sucker Rally? Musical Tribute! Stocks recovered from a huge move lower after a speculative WSJ report on a new data-dependent Fed. Any hikes coming? The Wall Street Journal reports Fed Weighs Wait-and-See Approach on Future Rate Increases. Federal Reserve officials are considering whether to signal a new wait-and-see approach after a likely interest-rate increase at their meeting in December, which could slow down the pace of rate increases next year. The Dow industrials tumbled were down over 700 points before sharply rallying in the final hour to close down about 79 points. Assuming one can attribute a stock market move to silliness as opposed to randomness, that WSJ report fits the bill. 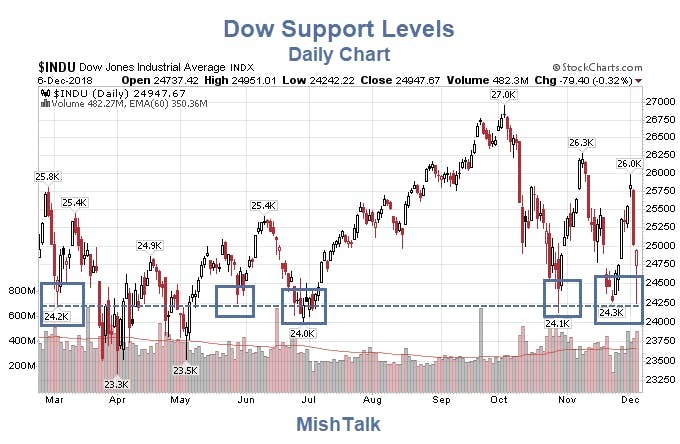 Technically speaking, stocks bounced off strong support. 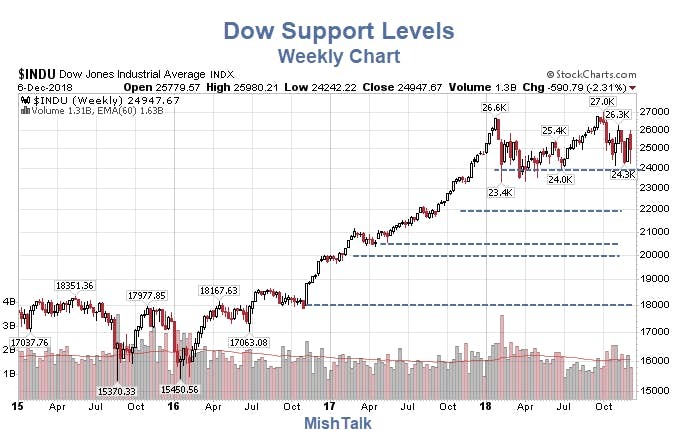 There are support levels every couple thousand points below but this is the major one. I highly doubt this rally holds. Each time a level is tested, conviction and buyers give away. Quintuple bottom? Really? Note that the above chart displays rate hike odds for a year from now, not the December 19, 2018 meeting coming up. I am assuming a hike on December 19. 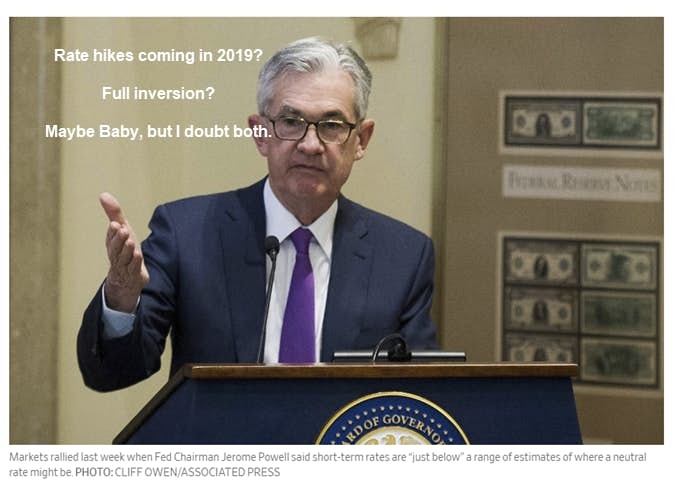 Will the Fed Hike in 2019? Full inversion? Maybe baby, but I doubt it. A recession is on the way. If the Fed does not hike in 2019, I doubt the 3-month to 30-year yield curve inversion that people seem to expect will occur. The Fed is Slowly Hiking Into a Recession and we are nearly there.